This picture was sent by Ricky Fritzsching, an alum of the Phantom Regiment. 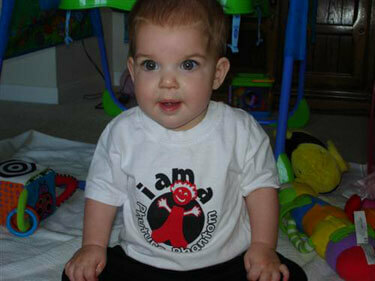 This is a picture of my nine-month-old daughter wearing her first Phuture Phantom T-shirt. Since mom and I are both Phantom Regiment alums, the Phantom Regiment organization has provided us with more than we can handle of "Phuture Phantom" baby clothes. You never know, she could be the next generation of color guard member like her mom or a member of the horn line just like her dad.